Pierce County Fire District 23 was established in 1967 with stations in Ashford and Elbe. In 2010, District 23 began providing service to the citizens of Lewis County Fire District 17 (Big Creek) by contract - utilizing the Big Creek station and apparatus. In 2009, District 23 purchased the old Department of Natural Resources compound near Alder and converted it into an additional fire station to better serve the citizens in the west end of the district. Our district covers an area of 67 square miles, including the communities of Ashford, Elbe, Alder, and Big Creek. 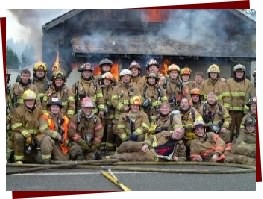 We also provide and receive mutual aid with the surrounding areas of South Pierce Fire & Rescue, Eatonville Fire Department, Mineral Fire Department, and Mount Rainier National Park. Pierce 23 Fire & Rescue is a combination department, with a paid full-time Fire Chief, a full-time Battalion Chief, and a part-time administrative assistant. We currently have 31 volunteer members, including a Captain, Lieutenant, Safety Officer, Chaplain, Firefighters, EMT's, and support personnel. The department is governed by an elected board of three fire commissioners. Commissioners meetings are held on the second Monday of each month, at 7 pm, at Station 23-1 in Ashford, and are open to the public. We typically respond to about 260 calls annually. Our members make themselves available to respond to calls for service 24 hours a day, 7 days a week by either responding from home/work or by working standby shifts at the stations. We respond to calls including structural fires, medical emergencies, vehicle collisions, water rescues, technical rescues, wildland fires, and other citizen assistance. We also provide fire and injury prevention and education services to members of the community. Follow the links on the left side of the website for more information on our services.